How do I export scan SmartScore X2 Pro or Songbook files to Finale, PrintMusic or other programs? If you own SmartScore X2 Pro and Finale 25 (or 2009 & later), you don't need to worry about choosing a file format. Just push the "Finale" icon in the upper right of the ENF toolbar. This will open Finale with the converted file looking exactly as it did in SmartScore. Otherwise, SmartScore saves to the.XML format for importing into Sibelius, Personal Composer, etc. Recognize, playback and manage complete band arrangements, operas, instrumental parts; even conductors’ scores! 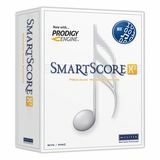 SmartScore X2 Pro is a professional-grade scorewriter with the world's most accurate music-scanning engine at its core. It is elegant, capable and incredibly intuitive and easy to use. It recognizes scores without any restriction on the number of parts. This item features academic pricing on the full version of SmartScore X2 Pro. It processes band arrangements, operas, hymns, musicals, instrumental and solo parts as well as full conductor's scores. A selection of Garritan band and orchestral instrument sounds is included free so your music will sound rich, nuanced and true-to-life. 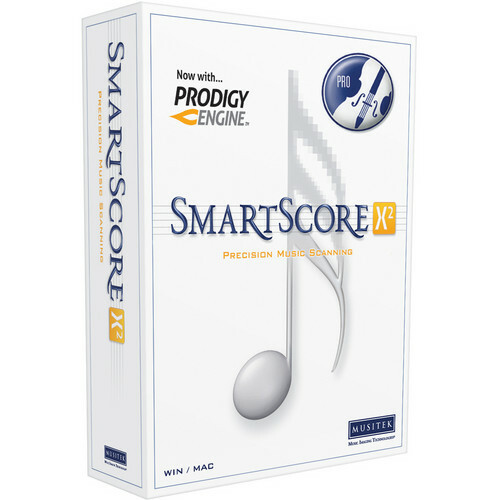 SmartScore X2 is an indispensable tool for any arranger, performer, music educator or church minister. No limitations. Contains everything featured in all other editions. Processes both multi-page PDF and .TIF files. Recognize, playback and manipulate conductor's scores, band arrangements, opera, chorale, transcriptions and PDF scores. Extract parts to separate files and burn to audio. Superior recognition and editing of complex symbols such as cross-staff beams and voices, key and time signatures including change-of-key and change-of-time. Precision recognition of chord symbols and guitar fret diagrams including symbols written as simple text. Chord symbols are automatically updated when key signatures are transposed. Chord configurations can easily be edited, updated and even made invisible. Extract parts graphically. Score Structure allows quick removal and re-arrangement of selected parts. Applied changes creates new SmartScore document, leaving original unchanged. Reformat scores simply and easily. Change page layouts, margins, staff widths and distances quickly and easily. Engraver quality output to print, PDF, Finale and MusicXML. Transpose and print directly from SmartScore. Open your score in Finale with just one button. Save as MIDI or MusicXML. Burn voices, parts or entire score to CD audio using Garritan sounds. SmartScore X2 includes a large subset of Garritan jazz, pop and orchestral instrument sounds. Garritan sounds are state-of-art digitally sampled sound libraries that realistically reproduce musical instruments in performance. Garritan sounds are carefully recorded samples of actual musical instruments. They are not electronically synthesized. View the list of sounds included in every edition of SmartScore X2. Order today and manipulate your manuscript library to suit your needs.